I worked at an occupational therapy clinic for years and learned quite a few things about the many uses of shaving cream. Sounds crazy, I know, but those OTs really love their shaving cream! And they should because it can be quite entertaining when used in play. Kids love to feel it squish in their fingers and can't resist smothering toys to only reveal them again with a squirt of water. A shaving cream snow storm is a good idea, so is a shaving cream car wash which I show here. Don't feel like you can only use it in the bathtub, having some towels and a tray make shaving cream play possible just about anywhere that is cleanable. Shaving cream - a half-way full to a full can is best to avoid messy, watery mishaps. I also buy the sensitive skin brand since it can be irritating to little fingers. A squirt bottle - adjust the spray so that it is a wide spray versus a direct one. A direct, hard spray could kick-up shaving cream into eyes. 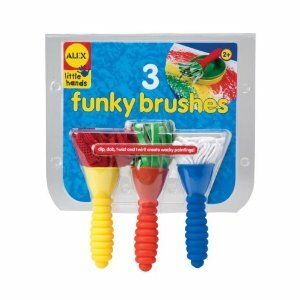 Brushes - Paint brushes are great, but I love these brushes from Alex. They look a lot like the brushes at the actual car wash.
A tray - allows you to play at the kitchen table or on the floor. Toys - the sky is the limit. Cars, animals, superheroes - ask your child to find toys who would like to be washed. This is a good time to discuss the properties of materials - what can be washed, what can't and why. As you can see from this child's selection, Buzz Lightyear, a baby and a dinosaur joined a tractor and a bulldozer in the fun. This play scenario is excellent to work on your child's sequencing skills. Talk about what happens first, second and last at the car wash. Ask your child how you will get the toys wet, soapy, dry, etc. Let your child do the squirting. The squirt bottle is fantastic for strengthening your child's hand muscles that are necessary for fine motor control. Try and make the play as symbolic as possible. Have your child put the toys in line waiting their turn to get washed. Encourage your child to talk to the toys and tell them what is happening. He may even want to collect money from the drivers. This is a great time to introduce some vocabulary like "wet" "dry" "spray" "squirt" "soapy" "dirty" "clean" "steering wheel" "driver's seat" "tires" "hood" "trunk." You may want to take on roles so that your child has to wait his turn and watch you or a sibling do a job. If one job is coveted (I guarantee it will be the person in charge of the shaving cream), help your child take turns. For children who are hesitant with messy play introduce the shaving cream slowly. Put a little dab on a brush or on the tray and encourage your child to just use the brush to apply it. If your child is really sensitive, latex gloves can be used to cover their hands. Once your child begins to acclimate, put a tiny bit of cream on their finger before encouraging them to dive in. The best thing to help tactilely sensitive children feel comfortable is to model it for them. A mom or dad who is hesitant to get messy will most likely have a child that is the same. So, dive on in! It's just shaving cream - easy, easy clean-up! Finally, you may want to take a trip to the real car wash before or after this play. It will make the experience of playing car wash together much more meaningful for both of you!